The dimensional stability and low expansion and contraction attributes allow Infinity from Marvin fiberglass windows to be coated in a full range of colors from Stone White to Dark Bronze with Sierra White, Cashmere and Pebble Gray in between. The interior of Infinity from Marvin windows is available in Stone White, Sierra or Everwood Pine, a unique engineered wood grain finish that provides the rich appearance of wood, yet is completely low maintenance for years of lasting beauty. Durable Everwood Pine can be stained to match the color of your home’s existing woodwork. Long lasting Everwood is made from an inorganic material and will not absorb moisture or decay over time. This remarkable engineered wood grain finish is easy to stain in just a few simple steps. It stains like wood and because of its extreme durability you’ll enjoy the rich natural look of wood for years to come. 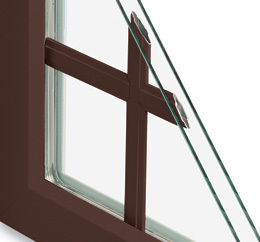 Each Double Hung sash tilts and removes for easy glass cleaning without removing the screen. The convenient tilt release button lets you tilt and lower the bottom sash into the room using only one hand. The easy wash hinge on the Casement creates an opening between the frame and sash for convenient washing from the interior of your home. The Infinity Glider is just as simple to clean as our Double Hung. An easy to operate tilt latch lets you tilt and remove the operable sash for almost effortless glass cleaning. Infinity from Marvin windows are available with the grille bars between the panes of insulated glass. Grilles-Between-the-Glass combine easy glass cleaning with the stunning detail of a grille pattern. Choose Simulated-Divided-Lites for an authentic divided glass look. Simulated-Divided-Lite bars are permanently adhered to the outside surfaces of the glass with a spacer bar between the panes of glass. Interior bars are available in Stone White or stainable Everwood to match your existing woodwork. Depending on the age and style of your home, Infinity from Marvin offers two window replacement methods. Both methods are designed for maximum efficiency and minimum disruption to your household. The insert installation method is used when your existing window frames are in good condition, but the sash need replacement. The frame-in-frame insert design is installed into your existing window frame with no disruption to the existing trim, interior walls or exterior siding. The full frame installation method is appropriate when your entire window has deteriorated and needs replacement or if you are looking for a totally new window size, style or appearance. With full-frame replacement, the entire window (sash, frame and casing) is removed and replaced. Whatever your replacement needs, Infinity from Marvin has the solution. Your windows may be losing up to 40% heating energy in the winter and 50% cooling energy in the summer. With the cost of energy on the rise, it is important to have a window that meets the highest energy standards. Infinity from Marvin fiberglass replacement windows boast a top spot on the list of energy efficient windows and offer a 20%-40% savings in heating and cooling energy cost over other window frame materials. Fiberglass is not a conductor of heat or cold and is 500x’s less conductive than aluminum window frames. Fiberglass frames insulate much like wood providing a barrier against extreme weather temperatures, keeping your home comfortable. Infinity from Marvin fiberglass frame and sash corners will not separate or crack delivering a high and consistent DP rating. The window design pressure (DP) rating will withstand 132 mph winds and 8″ of rain per hour driven by 42 mps winds. According to the Consumer Federation of America, the average American household spends over $2,200 per year on energy costs. Energy efficient windows using low-emissivity glass can cut your energy bills by 35%. To maximize your home’s thermal efficiency, all Infinity from Marvin windows come standard with Low E II glazing. Low E II reflects heat back to its source so summer heat is reflected outdoors and winter indoor heating is retained. At the same time, 84% of the sun’s UV rays are screened to reduce fading and damage to upholstery and carpets. Argon gas and warm edge spacer are also standard features. It all adds up to enhanced performance and long-term savings for you. Our optional Low E 366 glass provides increased performance for high sun exposure areas as in Colorado. This top-performance glass is formulated to reject solar heat while letting light in. With Low E 366 glass, light and visibility are maximized, 95% of the sun’s damaging UV rays are blocked, and most importantly, you and your home stay cool and comfortable.